This package is the perfect bundle for players who are looking to really load up and take on the battle. There are plenty of high capacity magazines included to ensure you have all the BBs you need to hold your ground or take out the opposing team. 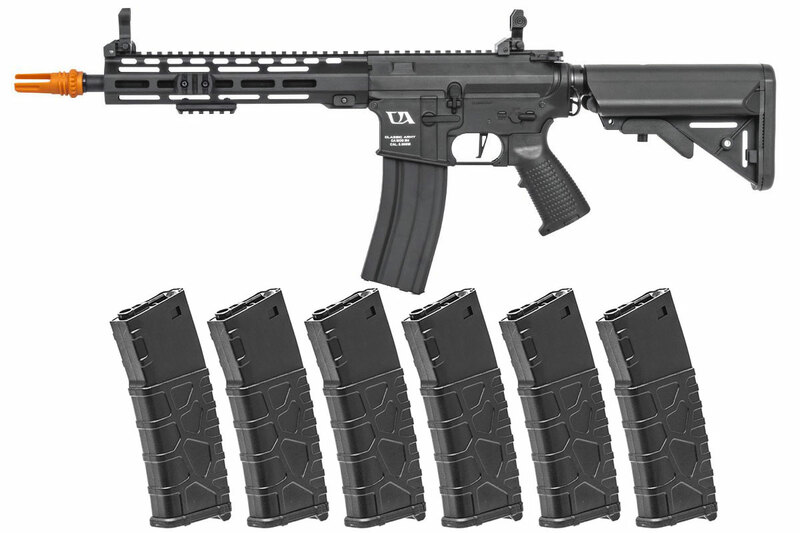 There are six Classic Army M4 VMS 330 round high capacity magazines in this deal along with the 300 round high capacity magazine that comes with the airsoft gun. The Classic Army CA4 ML10 M-LOK Skirmish Carbine is one of many Classic Army entry level rifles. Utilizing Classic Army's nylon fiber reinforced polymer allows for a lighter weight platform while ensuring extreme durability in a cost efficient package. The CA4 ML10 features a high rate of fire devastating firepower to your enemies, leaving them cowering away in cover. It also features an M-LOK rail system for a skeletonized version of a standard RIS M4 rail. Rail segments can be attached to the rail, allowing for the attachments of accessories such as lights, lasers, bipods, or grips. Front and rear sights are included, and can be flipped down, leaving you with plenty of rail space for you to mount an optic. It has a quicker change spring system so that you can quickly and easily upgrade or downgrade your spring once you remove the gearbox from the receiver. Internally, the gun has a 9mm bushing gearbox, 23k motor, a brand-new electronic control system, inline mosfet protected trigger contacts, 6.03mm tightbore barrel, flat trigger, and a quicker change spring system. Program the electronic control system to shoot at 3 to 5 round burst. Additionally, the ECS has motor protection and low battery detection to help protect the airsoft gun in the long run. It will shoot 330-350 fps using 0.20g BBs and 900-1000 rpm using a 9.6V battery. This model comes with a three prong flash hider that has threads on it to attach a QD mock suppressor. Additionally, there is a flat trigger preinstalled that allows for a quicker trigger pull and response from the airsoft gun. Accessories (i.e. optics, lasers, bipods, etc.) included by the manufacturer may vary.